I'm a food studies graduate student at Boston University and I'm trying to find out if food of the Chinese laborers in the 19th century changed in any particular way due to the fact that they came to America without the women. I'm interested in what they cook for themselves instead of what is served in the Chinese restaurant because my assumption is that if the men had been cooks, their food aren't probably going to change much. There isn't much said about their private eating so far, except for the fact that they were using pretty much the same ingredients like sea cucumber, dried mushroom, rice, seaweed, pork etc. I was wondering if they stopped cooking stuff like Cantonese soups because it takes hours and that it was usually women's job? Sisson & Wallace, Co. Advertisement - Railroad Gazetteer 1870 - page 53. Courtesy Kyle Wyatt, California State Railroad Museum. (1) The CPRR retained the Sisson Wallace Co. to transport native foods from China to the Chinese labor force. To validate this, see the Congressional testimony of Charles Crocker and James H. Strobridge. Sisson Wallace is still in business today, headquartered in the Bay Area of California; further validation is the collection of Chinese food artifacts collected by myself and others over the past years. Crockery containing food that I have found was all made in China. 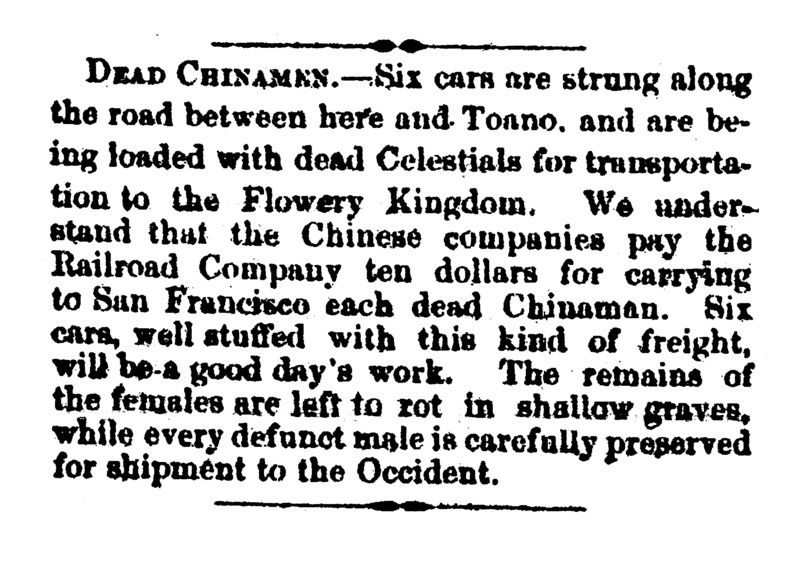 (2) There were CHINESE WOMEN on the grade, this can be validated by reading the Elko Independent newspaper of 1870 (the entire article is reprinted on the CPRR Museum site) that speaks of Chinese women that perished during construction were left "to rot in shallow graves." The Patterson House at Ardenwood Farm has a 1860's ledger from a local teamster, Sam Browne in their collection. 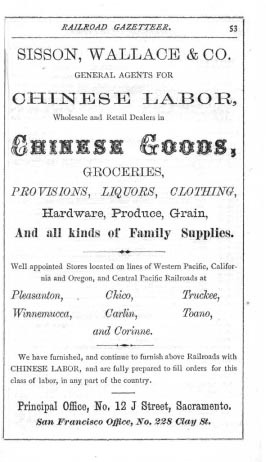 It lists 2 shipments (with lists of items) of "China Freight" being delivered to track workers in Niles Canyon, building the Western Pacific (of 1862) in 1865. I appreciate your help, very much. I wouldn't have known all these resources having been here in the US for only slightly more than a month. Looks like most of the Chinese food mentioned, in Kwangtung or the California, are in terms of ingredients rather than dishes. In terms of ingredients, they look almost exactly the same in both cities. But there's also a chance that the methods of cooking were different in the US due to certain circumstances (it was men cooking, economic constraint, time), and hence the dishes might turn out different from what they ate in China. For example, to save time and coal, they might prefer stir-fry to steaming or stewing. But that's still my assumption. I'll look at the records again to find out if the laborers then had the luxury of coal and time to continue their traditions! "The steamer 'Japan', which arrived last evening, brought, among other passengers, about 240 Chinawomen." "The steamship 'China' with passengers and mails from Hongkong and Yokohama, arrived at San Francisco last evening. 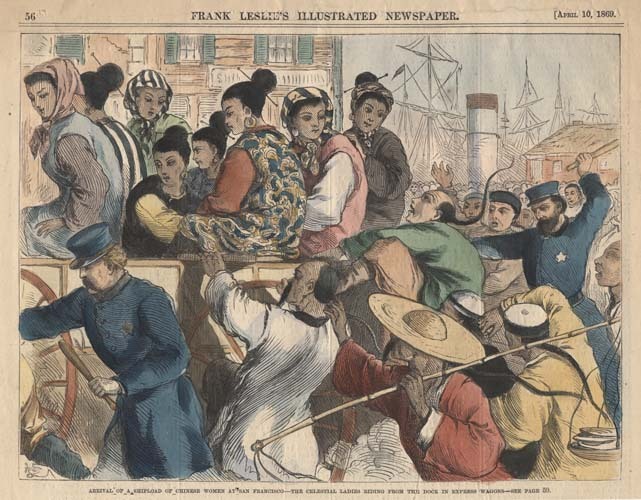 Among the passengers were four hundred Chinese women, about whom the resident male Chinese had a fight which nearly resulted in a great riot." The Federal Census of California in 1860 showed 2,038 female Chinese, and 32,061 males. 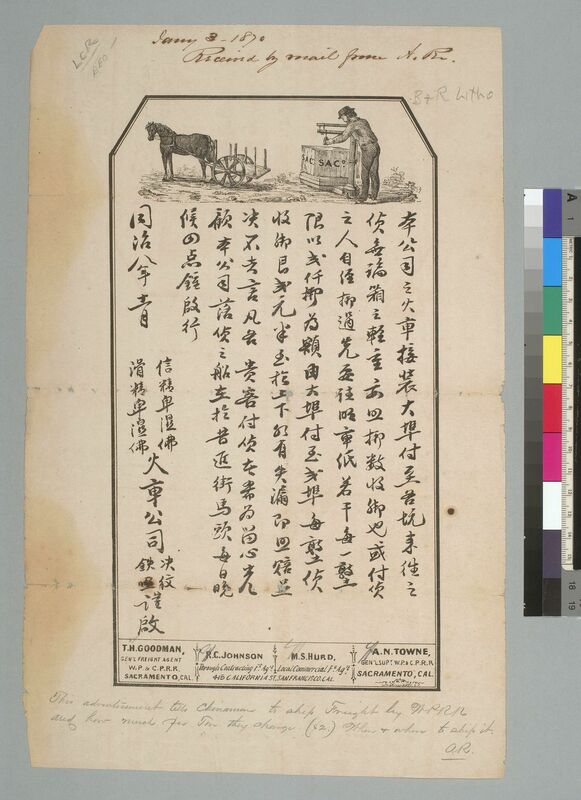 In 1870 the Federal Census shows 44,908 male Chinese in California, and 3,519 female. "The number of Chinese and Japanese arriving in San Francisco in the last nine months is given at 4,742, and 1.829 (Chinese) leaving." I had a small part in the production of a Chinese Central Television program a few years ago, which went in to some detail, with current photographs, of the towers built in China by Chinese citizens returning to China following their employment in the United States. The upshot of the film, which was narrated in Chinese, was that those that returned were better off than when they left. Some day, I hope, someone will write the complete story of the Chinese experience in California, not just a personal interpretation of the writers view. I'll add a few things. Sisson, Wallace & Company (later Sisson Crocker & Company) was still in business in 1888 when James Strobridge testified, and continued into at least the early 20th century, but I do not believe it is still in business today. My understanding is that the Central Pacific and its construction companies had an arrangement with Sisson, Wallace & Company whereby Sisson, Wallace & Company served as intermediaries with the Chinese 6 Companies to provide labor for the railroad construction (without charge to the Central Pacific companies), and in return Sisson, Wallace & Company had exclusive right to provide (sell) food and other supplies to the Chinese workers. I have no direct evidence of what Sisson, Wallace & Company charged the workers. I can speculate that the prices were high, but not completely unreasonable, given the reported amount of the workers' salaries that they were able to save after paying all their expenses. 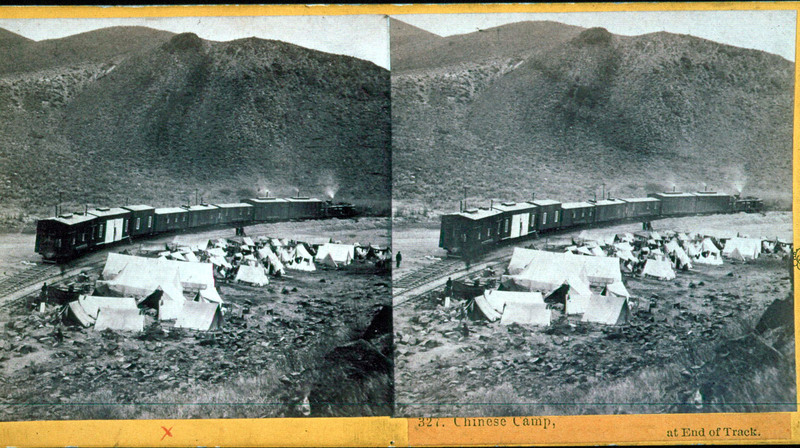 The Chinese reportedly had a high savings rate – certainly much higher than the white works for the railroad. According to a court case continuing on into 1893, Sisson, Wallace & Company was organized in 1868, but that may just be an incorporation date replacing an earlier partnership. Charles Crocker testified that similar arrangements had been going on since 1864. I do note that at least some, probably much of the Chinese food came from California sources; dried fish, other seafood, and seaweed, and probably also fresh vegetables grown in California. My understanding of the what Chinese crews worked is that there was a Chinese Headman and a White Foreman for each crew. These two would each count the number of men in tier crew going to work in the morning, again at lunchtime, and again at the end of the day. They would compare numbers and make sure they agreed. Each crew assigned one of their members as cook – presumably a man. On each payday the Headman would receive the pay for the entire crew, and would then divide the money up among the men, after deducting costs for food and other supplies.